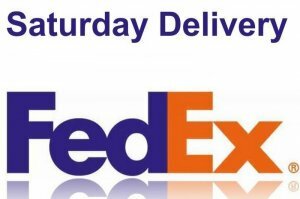 USA customers have the option of Saturday Delivery an additional service offered by FedEx. Most packages scheduled for Monday delivery by the competition will be delivered two days earlier at no extra cost. In fact, FedEx Home Delivery is faster to more residential locations than UPS Ground. Saturday delivery is available in the majority of U.S. cities with FedEx First Overnight®, FedEx Priority Overnight® and FedEx 2Day® services. FedEx First Overnight shipments picked up on Friday can be scheduled for Saturday delivery. You can visit FedEx website for more details.